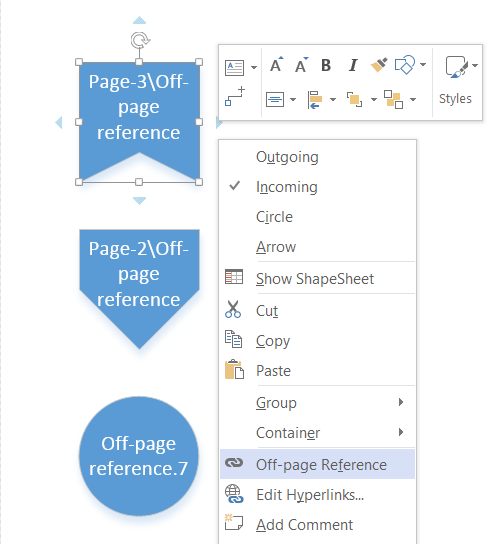 One of my favourite shapes in Visio is the Off-page reference shape on the Basic Flowchart Shapes stencil. I have written about this shape before ( see https://blog.bvisual.net/2011/09/02/page-grids-and-off-page-references/ ) but I did not notice a slight issue with it previously, so this article show how to overcome a couple of issues that I discovered whilst working on a project recently. 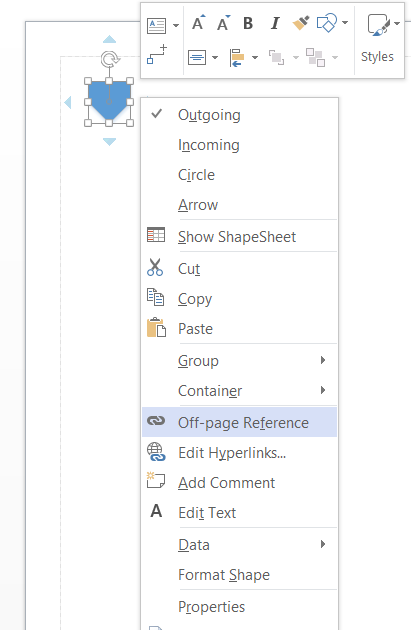 The shape is so useful for creating links between different pages and shapes within a Visio document (and can even be used to link between Visio documents), but it achieves this is a couple of ways. 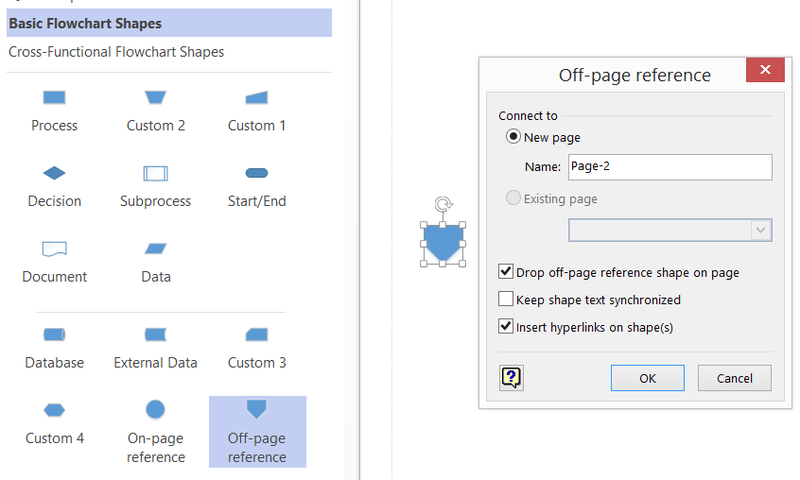 When dropped on to a page, it runs an add-on to prompt for the creation of a paired shape on an existing or new page. These two shapes work as a pair, and have reciprocal hyperlinks between them. When in Visio, the normal action is to double-click one of the shapes, and the hyperlink is followed to the paired shape. Actually, the double-clink fires the OPC add-on with a particular argument passed to it, which then reads the contents of some specific user-defined cells that hold the unique ids of the target page and shape. However, the add-on also creates a hyperlink on the shapes, which provides an alternative method of jumping from one shape to another. I find that this second method often only works on every second attempt in Visio, but it is the only method that can be used when the Visio document is viewed in a SharePoint web page using Visio Services, saved as PDF or XPS, or even as a web-page. Firstly, when a page is renamed after the Off-page reference shape has been created, or if the Off-page reference page is moved between pages, then the target page name does not updated in the shape. Secondly, when the target page contains special characters, then the URL fails because the hyperlink requires URL Safe Encoded strings (see http://www.w3schools.com/tags/ref_urlencode.asp ). Therefore, I had to write a macro to update the hyperlinks to cater for these potential failures. The end result is a macro that fixes the hyperlinks to be url safe encoded, corrects any page name changes due to page renaming or moving shapes between pages, and optionally adds the text of the destination page and shape to the Off-page reference shape. One extra benefit of this macro is that it sets the destination shape in the hyperlink, which is missing from the one generated by the OPC add-on. In fact, the pairs of Off-page reference shapes can be on the same page, but one of them will need to be moved from a different page back on to the desired page, because the add-on insists that it is created on a different page than the original shape. Of course, it would be better if Microsoft added these features into the OPC add-on…..
« New Visio book out now!